There might have been a bit of excessive puzzle purchasing here! Whack! Ouch! 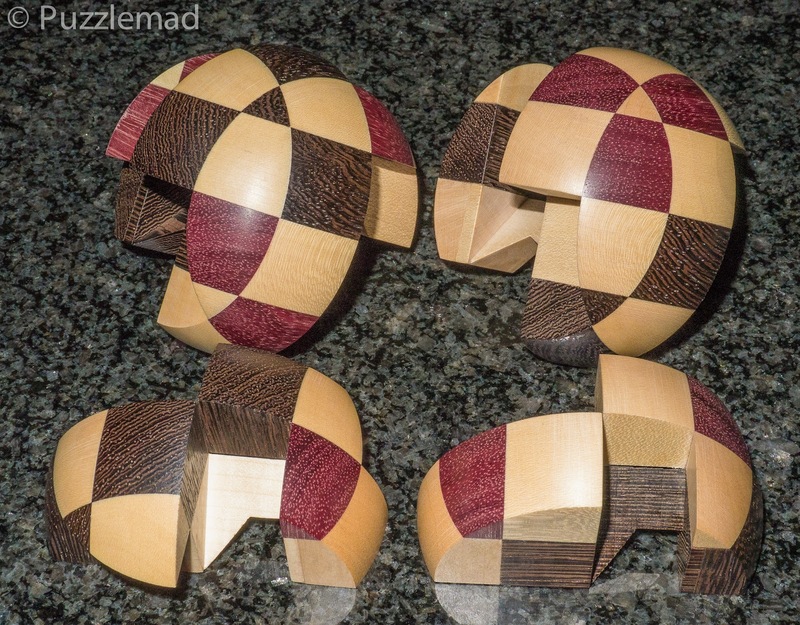 I seem to have refrained from buying new puzzles for a while (several weeks or maybe even 6!) so it seemed like a good idea to remedy that quickly before Mrs S got used to it! It began with some new toys from Brian Menold which I showed off on my New Additions page and have only really fiddled with so far and then rapidly was followed by a few extra purchases from Jakub who had given me a little heads up on some of his upcoming releases. I have mentioned many many many times how perfect his work is and I pretty much never turn him down. 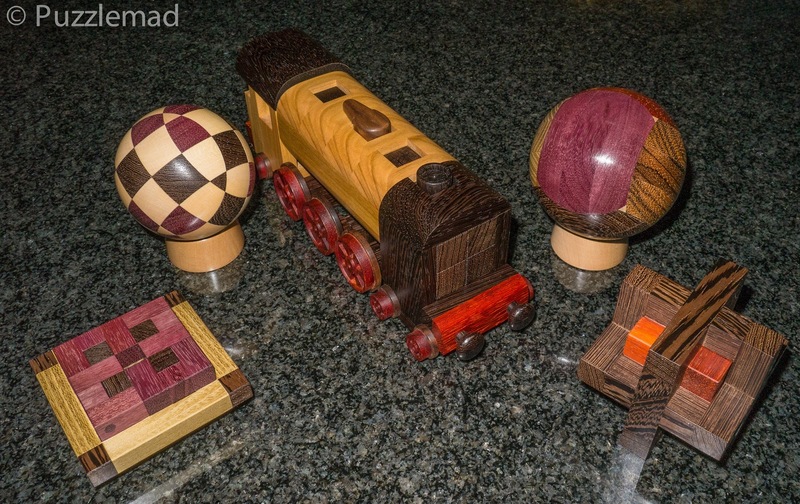 He had 6 puzzles on offer and 5 were completely new so how could I resist? A week after sending the PayPal across Europe some fine wood arrived chez moi. The box was HUGE and Mrs S just slightly irritated. After my unboxing and excited post of the above pic on Facebook, I was pleased that she who frightens the living Bejeeeezus out of me was molified by the sheer beauty of them and especially the gorgeousness that is the Flying Scotsman (designed by Terry Smart). Jakub asked my opinion on some of them (for his site) and so I set to work on them over the subsequent few days. Just in case you cannot be bothered reading the rest of my rubbish here then let me cut to the ending......these are lovely works of art with a nice puzzling element and are perfect for both collectors and beginners alike. There you go! No need to read any further, go and do something more useful than read my blog! 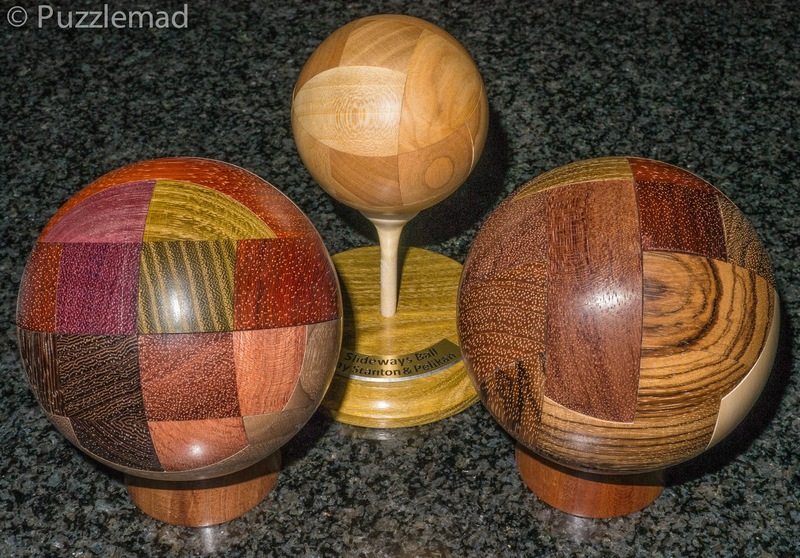 I have a few puzzles from Pelikan that have been simple(ish) interlocking or coordinate motion puzzles that have been magnificently turned into a ball - the loss of any edges and corners makes them both more attractive and more difficult to solve. I could not resist adding this beautifully made ball to my collection. It was actually designed by Jakub Dvořák in 2008. Having spent many years working for and later as co-owner of Pelikan puzzles he had seen the structure of an huge number of different puzzles and this can't have failed to give him ideas of his own. This is his first design heavily influenced by similar ideas from Leonid Mochalov. The O.S.M. 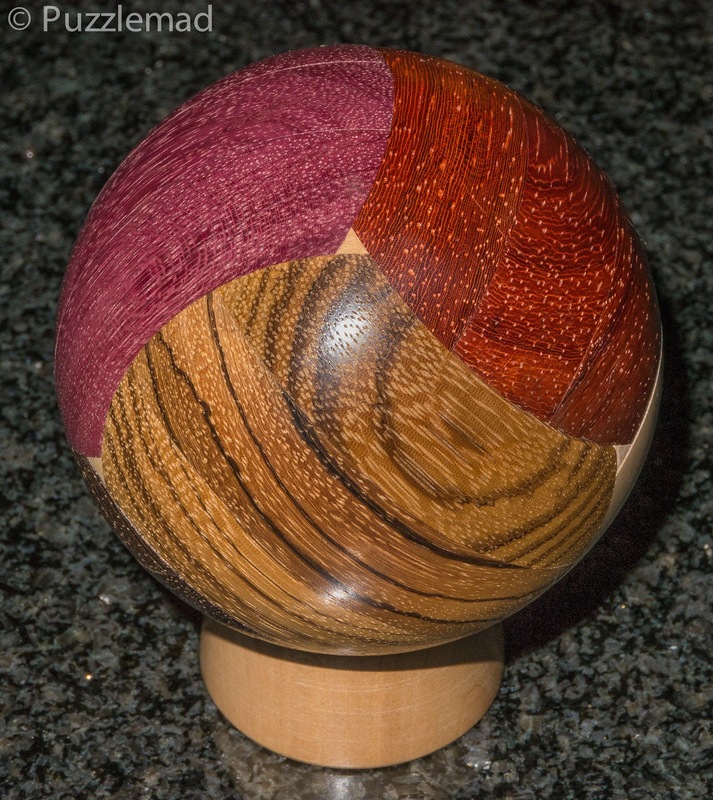 Ball is lovely object made from 8 different and contrasting hardwoods. It is highly tactile and comes with a lovely brass inlaid stand. Where do you start? I ended up pushing and pulling things at random until something moved - there is no visible clue from the shape/colours. After that the disassembly is not particularly difficult - it does reveal a nice clever locking mechanism which releases the first pieces in a movement that surprised me with its’ elegance. After disassembling the serially interlocking pieces revealing the masterful joinery, I scrambled the unusually shaped pieces and left them a while. The assembly is the real challenge. Again, it is not hugely difficult but is a very enjoyable and repeatable process. It makes a wonderful addition to my collection of puzzles from Pelikan that have also been turned to curved perfection. Inner Cube 2 - Absolutely irresistible! Inner cube 2 is one of many many designs by Osanori Yamamoto. I have already discussed Space Axis which has the same frame but a different interior and Inner cube 2 is the second of 2 using the same ingenious cubic external frame with interior pieces that appear to form a complete cube within the frame. The aim is obviously to disassemble the internal cube and remove it from the frame. This puzzle is gorgeous in contrasting Wenge and Padauk and with a level of 8.3.6.4 should not be particularly difficult. 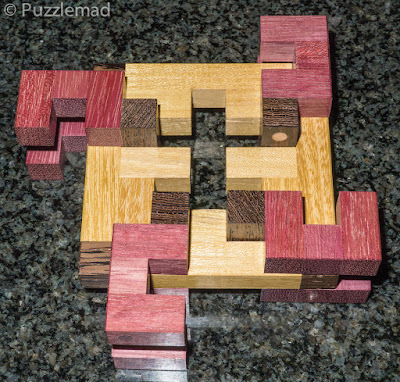 This is a very pleasant challenge with one move really quite well hidden. It took me about 20 minutes to disassemble it and of course I then had to scramble the pieces before attempting a reassembly. There are 31 possible assemblies of the pieces within the frame but only one is actually possible. Having not memorised my disassembly sequence, it took me over an hour to work out the assembly - this was great fun without being infuriatingly tough. I disassembled again today to take my photos for the blog and embarrassingly couldn't put it back together! Mrs S was most amused to see me at the kitchen work surface swearing away whilst the cats nosed around at all the pieces. No matter how many times I seem to try this one, I always struggle and take about 20 minutes to put it back together - really not terribly bright but at least it gives me good value for money! Rose is yet another interlocking design by the incredibly prolific Osanori Yamamoto. I saw this when he first showed it off last year and hoped that someone would make it available. How could I resist this version by Pelikan - especially one so perfectly made? My copy is made from Purpleheart, Wenge and Acacia and the precision has to be seen to be believed! 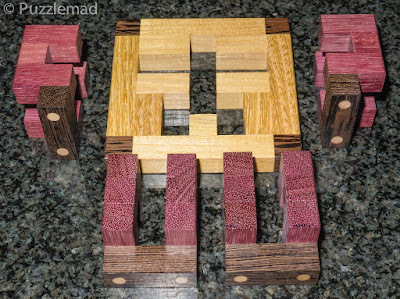 The concept is that of a board with a man shaped hole cut in it and the 4 identical pieces are inserted through the hole into a position with them interlocked. A mixture of sliding movements and rotations will allow the pieces to be removed sequentially. The removal process took me about 15 minutes and I actually thought to myself that this was a little disappointing…..until it came to reassembly! Getting this far was a relatively easy challenge and then.....Oh boy! As is usual, I had scrambled the pieces and left them for a while - this allowed me to totally forget the sequence (level 20.6.6.5 according to Ishino's site). The reassembly was an absolutely fantastic challenge; putting the pieces into the frame was relatively easy but that final sequence of 20 moves required considerable effort over about an hour of swearing under my breath! 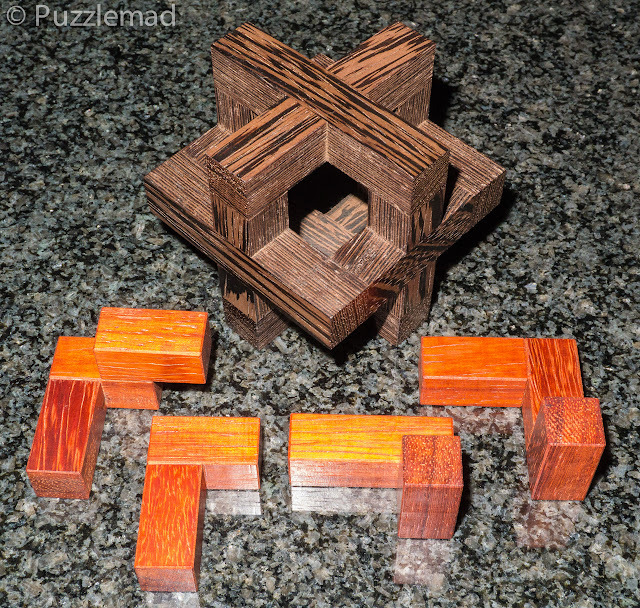 Now I could see why people had raved about the puzzle when it was released. Definitely a great addition to any collection. In fact, yet again, my disassembly today for photography got me into trouble! I spent another ½ hour desperately trying to put it back together to start writing my blog! I thought for a while that you wouldn't have anything to read because it was taking me so long. Phew! Got there in the end. The Quad Slideways Ball was created when Pelikan Puzzles converted Ray Stanton's amazing Quad Slideways Burr into a sphere. 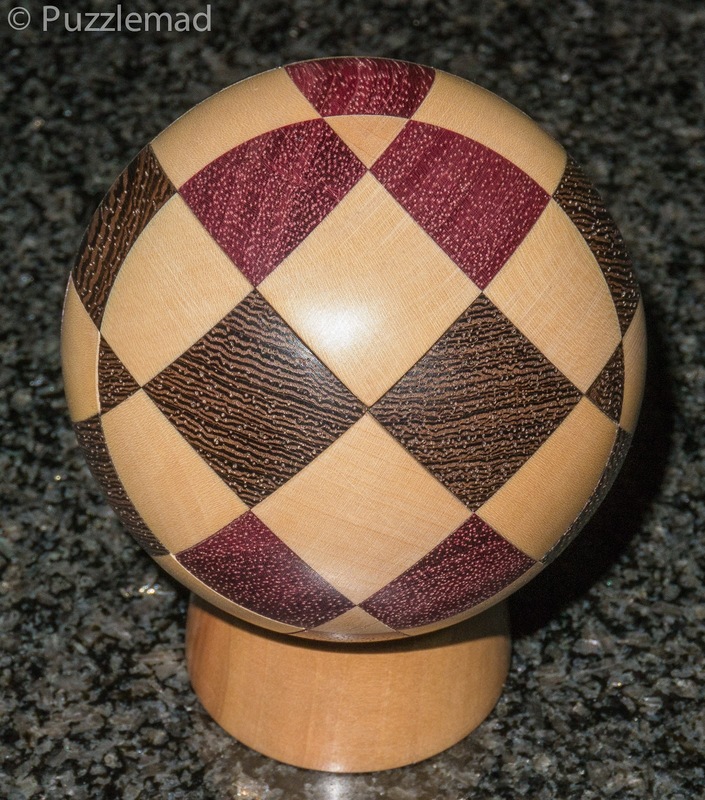 I didn't get a copy of the Quad Slideways Burr but did get the standard version and reviewed it here - I was therefore very keen to get a copy of this ball to see how it was different. This Ball apparently uses the same basic operating principle as the Burr, but Ray thinks it is really quite a different puzzle. 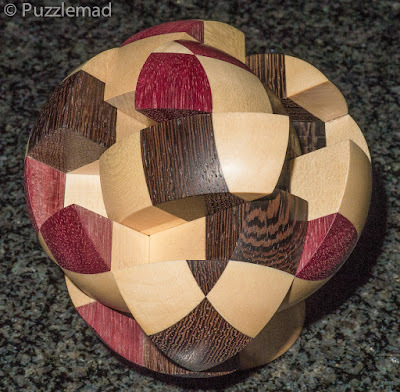 The ball shape and the altered color pattern eliminate most of the orientation clues making this puzzle more difficult to solve. OMG! Nearly gave me a heart attack! It flew open and only a quick yelp and grab stopped it from flying apart! Unfortunately that was the cue for the little sods to run off. With relief I slid it back together and spent a while trying to entice the recalcitrant pair from behind the 2 sofas which usually ends with me in Mrs S in a fit of giggles and rather short of breath. 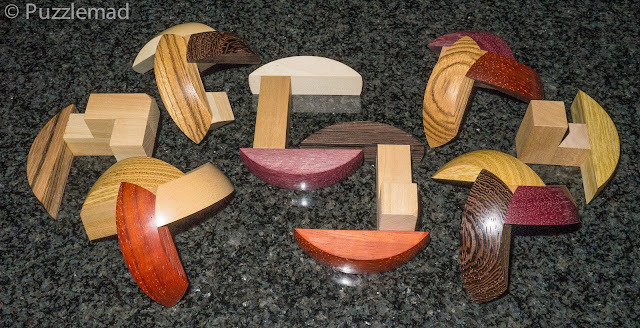 The reassembly was a tremendous challenge as it requires absolute precision of 4 separate pieces in exactly the correct placement before it slides effortlessly back into ball shape. 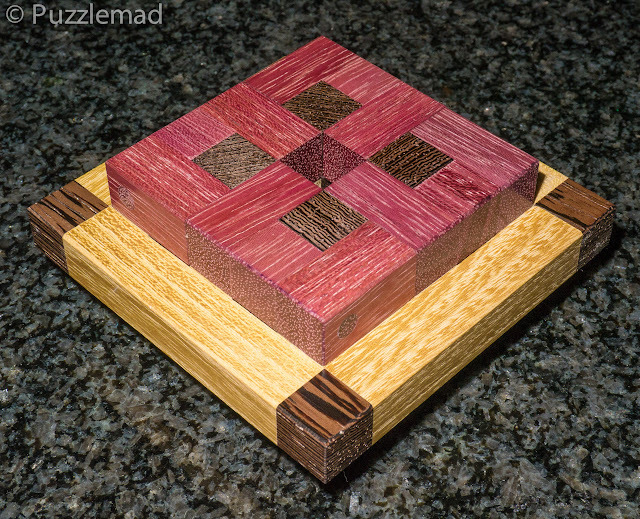 Like many of these coordinate motion puzzles, it seems to require more hands than one has to get it back. 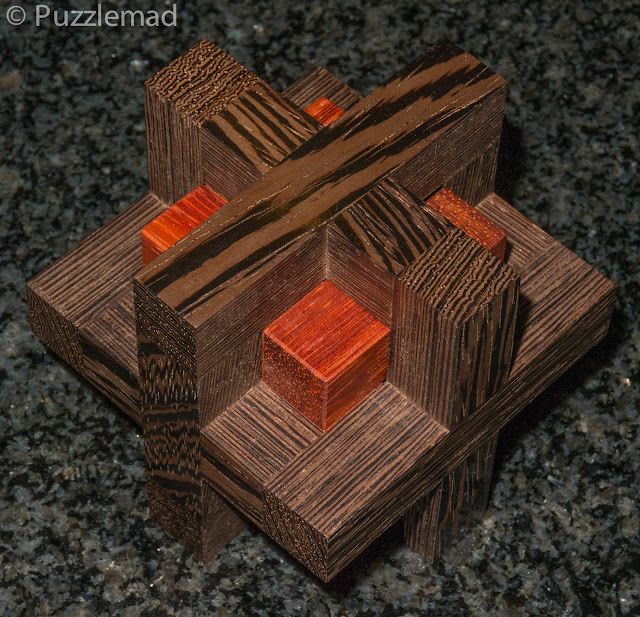 I actually discovered that it is part coordinate motion and part assembly puzzle. Having solved it with dexterity a few times I noticed that there is a little trick that I think Jakub put in deliberately. 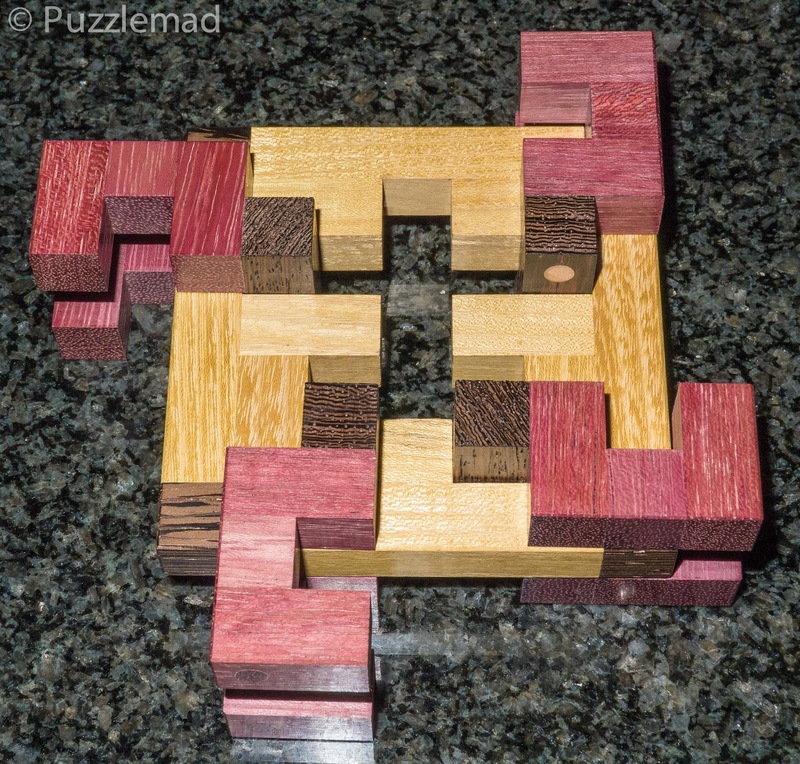 This little trick allows you to assemble part way with coordinate motion and less hands and then it is possible to slot the final piece in before the puzzle reaches the point of instability. This additional challenge is particularly fun and does make it less infuriating. 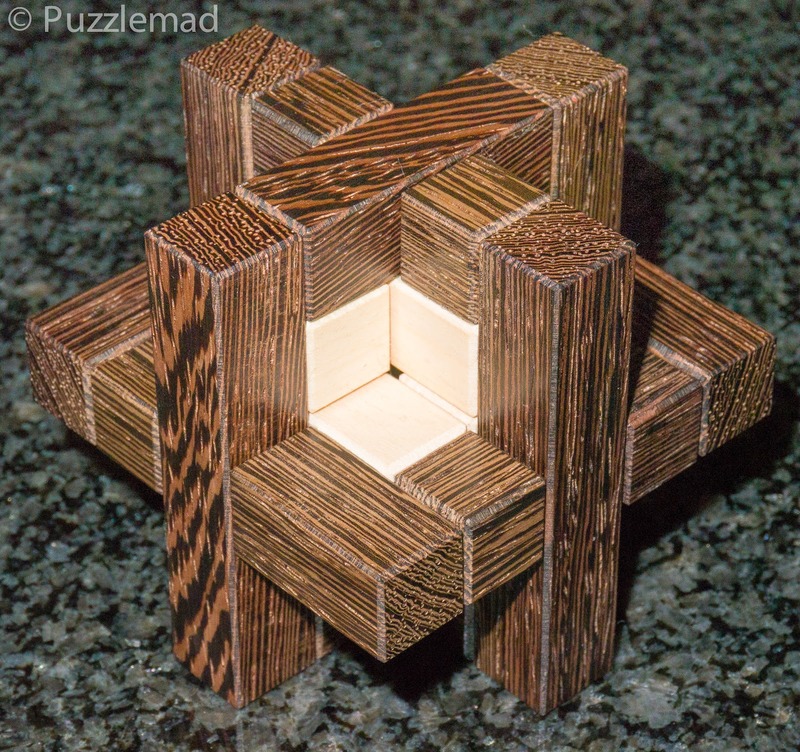 I now would be happy to torture friends with it in the knowledge that I can solve it with relative ease. I haven't begun to play with this beauty yet but couldn't resist showing it off. This is a stunning design by Terry Smart and first made by the very talented Stephan Baumegger. Terry and Jakub came to an agreement to have this design produced as a limited edition of 50 and it will be up for sale very soon. 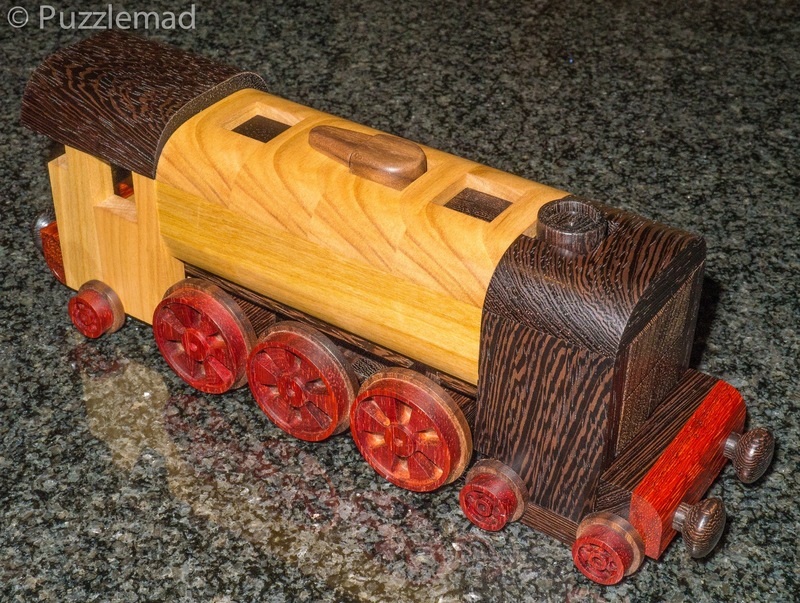 It is actually a complex burr with 4 long sticks the length of the train and the 3 large wheels plus front buffers and wheels are all part of vertically oriented sticks. 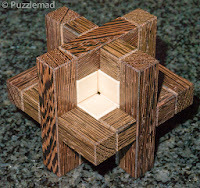 I do not know the level of this puzzle and do wonder whether I have the skills to solve it but won't mind if it stays assembled because it is one of the most gorgeous burrs I have ever seen!